Rethinking Faith and Church: Pope Francis Stirs the Religious Pot? Pope Francis Stirs the Religious Pot? What do all these quotes point to? In my way of thinking, they point to a servant leadership, not too dissimilar to the type Jesus portrayed. I find it strange that the conservatives would take exception to this. But then again, just as in Jesus’ day, people do like their kings, and they do like them decked out in all forms of pomp and regalia. Pope Francis seems to have other ideas, and I say kudos to him for taking this stand. No, I am not a Roman Catholic, and so in reality, none of what this pope does makes any difference to me or my spiritual walk one way or another. 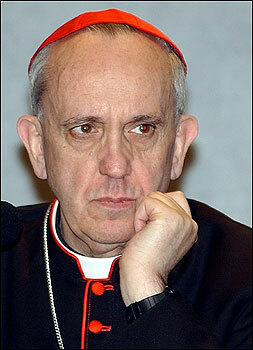 Still, I am encouraged by what I have seen so far from this new pontiff. I only hope that he has the backbone to stay true to his convictions on these things and not fall victim to the institutional trappings that many in religious leadership, regardless of catholic or evangelical or charismatic denomination, often succumb to. I guess that remains to be seen.